As a young adult I imagined my life following a straight path to reach my goals. I thought I knew where I wanted to be and how to get there. Instead my life has been a roller coaster full of twists, turns and upside downs. Twenty years later I think I found where I need to be. I have always struggled with my weight since I was a kid. I was one of those kids that if I looked at food I gained 5 pounds, while my brother could eat everything in sight and still lose weight. As a teenager I was a wrestler, which started the cycle of lose weight during wrestling season and gain it in the off season. In sixth grade I lost over 50 lbs during wrestling season. That continued all through high school and into my adult life. 4 times in my adult life I have lost a lot of weight from as little as 80 lbs up to 112 lbs. I did it once by clean eating and a lot of hours in the gym. I tried the cookie diet, Atkins, Weight Watchers and just about everything else out there as well. Back in 2009 I was at a really low point in my life. I was really overweight, drinking heavily and doing a bunch of stupid stuff. I lost a couple of really close friends due to some of my not so great habits of drinking a couple bottles of liquor a day. It was the lowest point I have ever hit in my life. One of those friends sat me down and said I needed to take a good look at myself and decide if I was going to start being the person they knew I was. 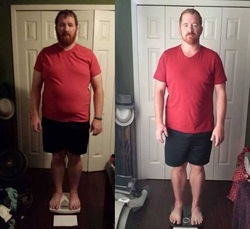 The next day I busted out a copy of P90X had collecting dust and decided to change my life. I rocked it too! I didn’t do it the right way though. I ignored the nutrition because I thought I knew better. I really didn’t. When I figured it out I had already completed 10 weeks of the program on less than 1100 calories a day. I lost a ton of weight, but it really wasn’t the right way. After that I went into Insanity, fixed the nutrition a little and got amazing results. During that time I met a guy named Derek on the Beachbody forums and he was so supportive and helpful that I chose him as my coach when I decided to sign up as a coach myself. I usually tell people I usually tell people that I signed up as a discount coach but that really isn’t true. I actually didn’t even start using Shakeology until a year or two ago. I wanted to pay it forward. I was determined but that quickly fizzled. I never told Derek, but I was actually talking to Beachbody about being in the next P90X infomercial. They were intrigued by my story but as I was filling out the paper work it was all a bit overwhelming. Reflecting on the pics, the friends I lost, the mistakes I made in the past all became too much for me to deal with. My transformation was literally 5 months and I never had time to deal with the real reasons why I wanted to change. So I figured I could get by without doing a workout. Then another and the downward trend continued. If you don’t focus on changing your habits and your mindset, any changes to your body will only be temporary. My job at the time also decided to move me all by myself to California. Derek reached out to me a few times during this time, but I was slowly falling back into a not so good place. I was in a city where I knew only a couple of people. Working as the only person in an office so I didn’t even have co-workers. I had to take clients out so I started eating out at nice restaurants and socially drinking again. I finally pulled myself back up. Left that job, quit drinking and moved back to Orlando where I had the support of family and friends. I now do consulting and frequently travel which hasn’t been the greatest for my eating and exercise habits. I have a passion and lust for good food that isn’t always good for you. The summer of 2013, my girlfriend and I decided we couldn’t live such an unhealthy lifestyle anymore. My doctor helped with that decision. I was back up to 288 lbs, my cholesterol was out of control, my blood pressure was high and my liver function was subpar even though I gave up drinking a few years ago (fatty tissue was putting pressure on my liver). On top of that I also am plagued with low testosterone (kind of a male version of menopause). I have trouble building lean muscle mass and if I don’t exercise I literally end up a blob and will be on hormone replacement therapy the rest of my life. At that point I made a commitment to change my life and to change it forever. So why am I a Beachbody coach? I know what it is like to be at a low point in my life. I know how hard it is to dig myself out of that hole. It is even harder when you do not have the support of people who care about you. I want to be the guy people can count on to be there when don’t know where to turn to. I have spent almost 20 years in an industry that makes rich companies richer. I want to spend the rest of my life from here on out helping people get healthier and to live fuller, happier lives. I want to be the best me I can be while helping others do the same. There is a bit of selfish motivation behind it as well. I know if I am committed to helping others that it will also force me to help myself. I try to live everyday with integrity and loyalty to those around me and I can lead others if I am not walking the walk. This time around it is taking me a bit longer to reach my health goals, but I think I am doing it in a much better way. My original Beachbody P90X and Insanity Transformation pictures.